Disclaimer: I’ve never really ‘got’ beauty salons. Not all-under-one-roof ones – I mean, surely a one-stop ‘we-do-everything’ shop can’t be as good as the ‘experts’, can it? When I need my nails doing, I’ll hit up a nail bar. Hair needs a fancy up-do? Hairdressers’ll sort it. The same goes for waxing – give me a specialist salon like Strip or Ministry any day of the week. Beauty salons just don’t sound very efficient to me – how can somewhere offering a treatment list the length of your arm /possibly/ be up to scratch with all of them? I’d always viewed them as overpriced venues punters visit to ‘unwind’ (eg. loll around in loungewear or dressing gowns, leisurely traipsing from mani-station to massage bed). And to me, the idea of hunkering down in a dressing gown anywhere but my own home (or OK, a swanky private spa somewhere in the country) feels a bit alien. But I’m happy to admit when I’m wrong. 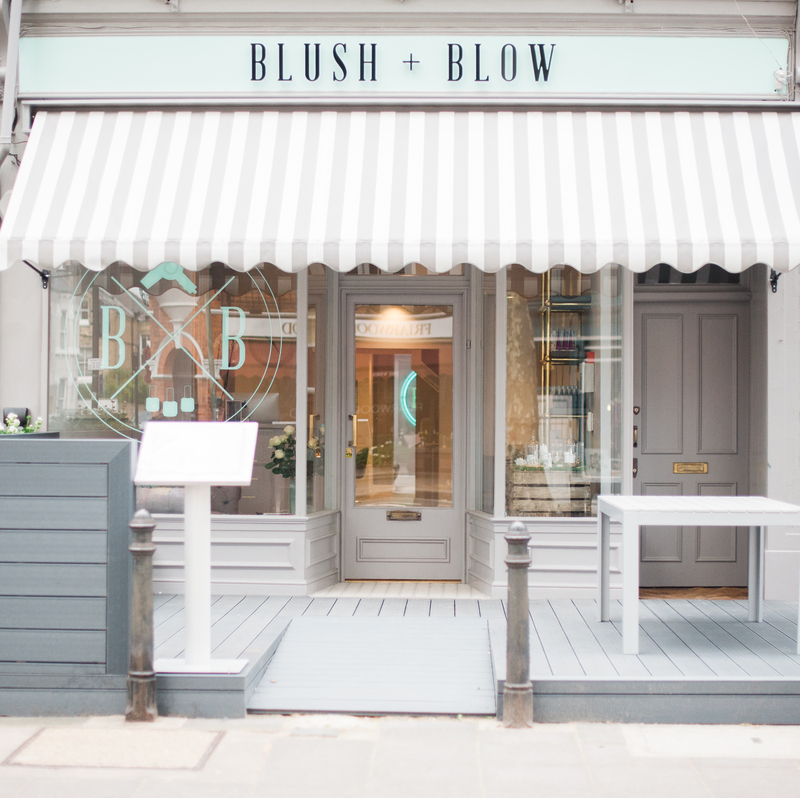 Firstly, Blush + Blow isn’t a ‘dressing gown’ kind of place (the clientele are pretty smart actually – it is Parsons Green, after all). And unlike most salons, the beauticians/therapists at Blush + Blow each specialise in specific treatments – so you won’t necessarily find the same person tending to your locks, as your nails for example. Each therapist really knows her (it’s a female-run salon) stuff, and it helps that the building looks like something from Homes & Gardens (think Farrow & Ball-esque muted grey and blues, with soft lighting and cosy armchairs to sink your limbs into). Tea is served on trays in delightful B+B-branded china mugs, and the salon’s Cavalier King Charles (Pickles – very adorable) happily pads around. The result? It feels more ‘home-from-home’ (in my dreams, anyway) and less ‘in/out salon’. Perfect. 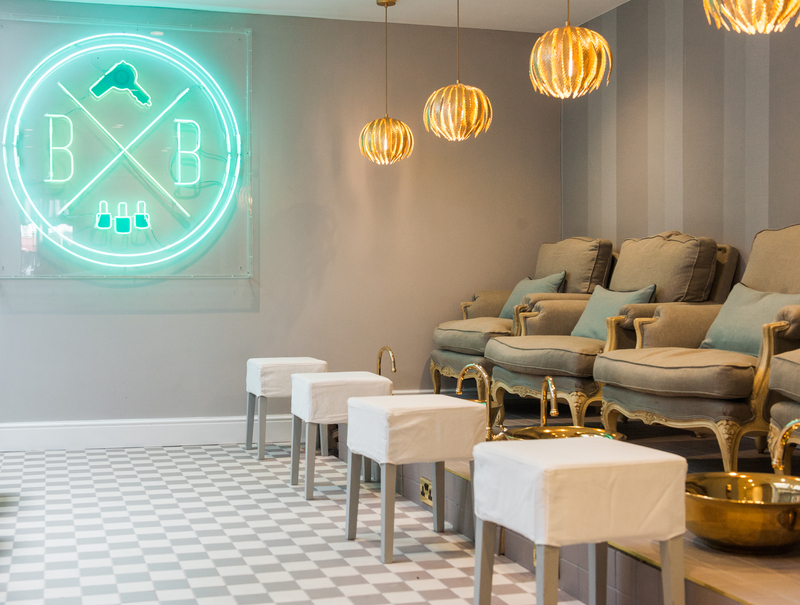 Founded by makeup artist and entrepreneur Bridget O’Keeffe, the salon offers pretty much everything a weary bod could dream of – from blow-dries (no cutting, just styling) to nails, makeup and body treatments (massages, lashes, waxing). The light and airy open-plan ground floor is dedicated to hair, nails and makeup, and the three cosy treatment rooms downstairs are private, peaceful spaces for one-on-one treatments in perfect solitude. I plumped for a massage, using award-winning (and personal fave) REN products, and bikini wax, followed by a mani and pedi (with Essie polishes). The salon also uses Kevin Murphy and Unite hair for styling and blow-dries. While the massage and waxing were both utterly brilliant (my therapist was lovely, considerate and terribly professional) it was the mani/pedi that really clinched it. I defy anyone to sit in one of B+B’s delightfully-oversized armchairs with a perfectly-brewed cup of tea, feet soaking in a copper bowl (oh-so-Instagrammable, btw) and feel unhappy. My therapist worked genuine magic too (I’ll spare you the before/after pics). I left my afternoon at B+B feeling preened, relaxed and totally lifted – something that (in London at least) is very special indeed. I love it. Just want to get there !